What if the Americans got themselves an actual NHS? While scanning this piece about the unpopularity of the Romney-Ryan plans for healthcare, one figure jumped out at me. The total Medicare bill: $549bn, roughly £338.5bn. This programme covers 48m Americans – 40m of whom are over 65, and 8m are people with disabilities. That’s a cost per capita of roughly $11,400 or £7,000. Compare that to the NHS. For ease of comparison, these are the England-only numbers. The whole population of 51.8m was covered in 2010 for a total of £105bn, just over £2,000 per capita. Now, clearly Medicaid covers a section of the US population that is much more expensive to care for, but we have some information about the NHS costs specifically for treating people of retirement age. This Parliamentary research paper says that in 2007-8 the value of NHS treatment to retired households was about 85% higher than the value to non-retired households, and, from that same paper, the retired are about a sixth of the population. A spot of simple maths gives us a rough NHS cost for the non-retired of £1749 a year and £3236 for the retired (again on a crude assumption that the average household size of each group is the same). Note: I’ve not factored out the higher costs for caring for people with disabilities, either, so the comparisons above will also be inaccurate to the extent that those costs diverge from the costs of care for the over-65s. So let’s say the Americans had a rush of socialist blood to the head and set up a NHS along pre-Coalition lines. What might the budgetary implications be, aside from the setup costs? Let’s assume treating those on Medicare would cost the UK retired figure, and treating the 260m Americans who aren’t eligible for Medicare would cost the UK non-retired figure. The Medicare crowd would then be covered for about £123bn ($200bn) – a saving of $349bn, Republicans please note – and everyone else would be covered for £455bn ($738bn). At a total cost £578bn (or $938bn) all 260m Americans would have healthcare free at the point of use, just 70% more than the current cost of caring for fewer than a fifth of them. But Medicare isn’t the only government health programme LBJ left our American friends. Medicaid was established as a medical safety net for those on low incomes, and in 2008 it cost about $338bn, roughly £208bn, to cover a further 60m Americans, albeit with plenty of costs for those poorer citizens still to bear. No doubt the 2010 figure was higher, but even assuming not, that takes total federal expenditure to $887bn, or £547bn. So, to conclude: America – you’re spending $887bn to provide healthcare to 108m people, little more than a third of the population, but you could spend less than 6% more, just a further $50bn, and cover the whole country. In fact, your total costs are already almost three times more than that when you factor in private expenditure, from companies and individuals – a whopping $2,600bn. Sure, some of that wouldn’t be covered by your shiny new National Health Service, but the savings would be truly enormous. No-one would pay a penny when they got sick except a small flat charge per prescription that the Medicaid and Medicare crowd would be exempt from entirely (this is a comparison with England: in Scotland, Wales and Northern Ireland you wouldn’t even pay that). No more fear of losing insurance. Hell, no more insurance. Cut wasteful spending. Save the average family $20,000. Put money in the pockets of the middle class and the working class alike. Economic benefits, not least because people might dare to start more businesses rather than clinging to an employer’s health insurance. This is nothing less than a fiscal conservative’s dream. Even Obama’s baby step in this direction isn’t unpopular anymore. 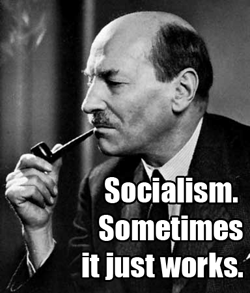 Just don’t mention Bevan, Attlee and Beveridge. Free care for the elderly. So good, people are dying for it. If you want to pass on anything of value to your children, you have to make sure you leave this life before you get too sick or old. That is the ghastly situation that Scotland’s senior generation faces at the moment. It’s nothing to do with those nasty Tories, this is a heartless scandal that is made entirely in Scotland. “On average an individual can expect to pay around £27,144 a year for a residential care home, rising to over £38,000 if nursing is required. “ The weekly figure quoted for Scotland was £566/week, or £29,432/year, which is already above the £24,750 cut-off for having to pay your own way. Kiss goodbye to the fruits of your hard-earned labour if you can’t look after yourself. Basically, as I understand it, even if you had a mere £100,000 capital locked up in a family home, you would have to liquidate that asset to pay for the first three or four years of your care before the Government would provide the much vaunted ‘free’ element that it is so keen to boast of on its glossy pamphlets. More worrying is the apparent creeping privatisation that is still percolating through the system, seemingly unchecked. So not only are older people handing over their savings and selling their homes to pay for their own care, but part of their money is going into the profits of big business that often, too often, can’t meet basic standards. It can’t be right. The issues around Southern Cross and Elsie Inglis are two of many examples where private care for what should be a public provision just doesn’t work. At a sprightly early 30s, I’m far from being an expert on the issue, but the more I read about what lies ahead for Scotland’s elderly, the more I realise that we are so far away from having a truly civilised society that we might as well start again from a blank sheet of paper. Rather than decide what level of tax we want to pay and work how far it goes, why has no political party worked out what costs are required to run a modern, compassionate, cradle-to-grave nation and then adjusted the tax levels accordingly? Teaching our children to a satisfactory standard cost x, ensuring a decent minimum level of health standards (including looking after our elderly) costs y and policing our numbers to a degree where we all feel reasonably safe costs z. Add everything up and spread that necessary income across the taxes accordingly. The obvious explanation for this not having taken place is that the result would be tax rises and the political party who proposed them at the next election would get unjustly stuffed. Witness the Scottish Greens last year who failed to take advantage of a Lib Dem implosion, no doubt due to their argument that relatively minuscule tax rises were unavoidable. Sweden gets it, of course. A VAT rate of 25% vs ours of 20%, an income tax rate of 48% vs ours of 40%, a Corporation Tax rate of 26% vs ours of 24% (23% from 2014). Sweden benefits from a state monopoly on booze, a law against people owning second homes, shared parental leave, generous social security and a health service every bit as effective as the NHS but at about a quarter of the price. The result? A balanced, prosperous, healthy, civilised society that can afford, amongst other things, genuine free care for the elderly. Suggest to a Swede that one needs to sell their home to be looked after by the state and be prepared to be embarrassed by their stupefied reaction. If the numbers in Scotland don’t add up, then the numbers don’t add up and we just have to try something else. We surely can’t continue to asset strip the elderly in order to make Scotland’s ends meet. The people of London would undoubtedly be better served by their police force if cannabis users were not being arrested and charged. And for the vast majority of cannabis users a criminal record would be far more damaging to their prospects than using cannabis will ever be.There is nothing factually wrong with Brian Paddick’s “Police are wasted on cannabis” campaign. So de facto, turning-a-blind-eye, decriminalisation is a step in the right direction. But as a policy end-point it is starkly illogical. If a drug is illegal, but no one is ever prosecuted for using it, then there can be no justification for its continued illegality. A trade that could be regulated and taxed and contribute greatly to the national economy should not be allowed to be dominated by organised crime. We might be able to save money in not prosecuting users, but we would still be spending money and time pursuing and prosecuting the producers and dealers. This endeavour has not had any success in restricting cannabis supply to any meaningful extent in the past, and is highly unlikely to do so in the future. If the act of using is no longer immoral to the extent that society deems it should be illegal, then the act of supplying can not be deemed immoral if the responsibility lies in the hands of a supplier who has only the best interests of the customer in heart. A policy of strictly controlled legal supply can create such a supplier and is the one that government should be investigating with great urgency. The motion passed by Liberal Democrat conference last September was determinedly “tough on drugs” in its intent. Past policies that implied tolerance of drug use were swept aside in favour of policies targeted at the restriction of the ability of drugs to do harm. Paddick’s proposals sadly take us back to our old ways, and may even increase the potential for harm caused by the drug itself. If we exclude the obvious harms of a criminal record, arrest at least focuses the mind of the user and their family on their drug use and might cause them to re-evaluate their behaviour. By removing the chances of that happening, any problems users experience are more likely to develop further and have serious implications for their health and happiness. So, on the scale of “tough” to “soft” on the ability of cannabis to do harm, de facto decriminalisation as proposed by Paddick is probably a step towards softness. If we want to get tough on the ability of cannabis to cause harm, then we have to deploy policies which are more likely to prevent problems emerging and which are more likely to facilitate early intervention in order to halt the progression of any problems which do occur. The model of decriminalisation adopted in Portugal – where possession is still illegal but an administrative and not a criminal offence – takes us back in the direction of toughness. Rather than turning a blind eye to cannabis use, the police refer users to panels tasked with determining whether treatment is appropriate and delivering education on harms and available services. In a situation where contact with the police can only be positive for a drug user’s prospects, concerned family and friends need have no qualms about seeking help for a loved one. In Portugal, prospects for cannabis users are better, but again their de jure decriminalisation policy is starkly illogical for the same reasons as the de facto decriminalisation proposed by Paddick. It is only with strict government control and regulation of a legal market that we can optimise our restriction of the ability of cannabis to cause harm. Rather than have information on the harms of cannabis delivered only after an unpredictable encounter with the police, this information can instead be provided in the environment of a pharmacy, by someone trained for the purpose, prior to the first time a customer uses the legally supplied drug. The ability to advise customers on the potency of strains and encourage safer modes of administration, means the customer is far less likely to come to harm. The undermining of the illegal market combined with age restrictions should hopefully reduce availability of cannabis for children, while reducing further the necessity to expend police resources against the black market suppliers. If it is decided to educate first-time users on the early warning signs of psychosis, then the increased number of people in society equipped to identify these signs means those developing psychosis are more likely to be helped regardless of their drug use history. So Brian. It is time to move beyond liberalising our drug laws. De facto decriminalisation is not the best answer for the people of London or anywhere in Britain. The policy that is the toughest on drugs and crime is a plea to government for the strict government control and regulation of a legal cannabis market. I have strong suspicions that if it is communicated properly, it will garner you far more support that your soft-on-drugs, baby-step, 4/20 announcement. Thereâ€™s plenty going on this week which demonstrates the Coalition government should pay more heed to where Scotland is and what she thinks. Nonetheless, David Cameronâ€™s proposal on minimum pricing for alcohol is undoubtedly inspired by Scotlandâ€™s lead. Maybe you missed it in a boozy blur between Christmas and New Year, but David Cameron has instructed civil servants to pull together plans for minimum pricing for alcohol sales in England. According to The Daily Telegraph, this could either be the Scottish model, banning the sale of alcohol priced below 45 pence per unit, or as taxes based upon the number of units in a drink. Whitehallâ€™s strategy on alcohol will be published in February. The Scottish Governmentâ€™s Bill is at Stage 1 at Holyrood, after being introduced by Nicola Sturgeon back in October. Labour at Holyrood donâ€™t believe minimum unit pricing is the answer to Scotlandâ€™s alcohol issues as â€œit will not target problem drinksâ€. But might they be compelled from February onwards to take an opposing view to Labour at Westminster? Back then, Andrew Lansley, now Health Secretary, dismissed calls to set a minimum price for alcohol from both the Chief Medical Officer and the Commons Health Select Committee. Although the Coalition has banned supermarkets selling booze as a loss leader, and introduced higher duty on super-strength beer and cider, Lansley reportedly favours a voluntary approach on the part of the seller, indicating that Cameron has over-ruled him with the minimum price move. A split between government ministers is always fun for oppositions. But with his previous comments, as well as many Labour-controlled councils within Greater Manchester and Merseyside considering the introduction of bylaws to set minimum alcohol prices, it wonâ€™t be so easy for Burnham to dismiss Cameronâ€™s move for minimum pricing if it is included in proposals come February. Of course, Burnham didnâ€™t do anything when in power about minimum pricing, and his somewhat cool comment above could mean Labour will oppose any move by the coalition to introduce minimum pricing. But Burnhamâ€™s performance during Labourâ€™s leadership elections in 2010 sees him regarded as a considerate centrist, while his recent campaign for the full disclosure of Hillsborough papers means heâ€™s unafraid to grab emotive, powerful public issues. I would bet he wonâ€™t oppose minimum pricing just because Cameron wants it. Meanwhile, Scottish Labour is gone too far on record opposing a minimum unit price to adapt to it developing from a Scottish to a UK debate. If Burnham backs Cameronâ€™s measures, Jackie Baillie has to stand alone. Labour in Holyroodâ€™s not wrong in saying minimum pricing isnâ€™t enough on its own to tackle Scotlandâ€™s demon drink problem. But I think they are mistaken to not back minimum pricing. To survive Scottish Labour needs to develop an identity, both political and on policy, to distinguish itself from the Westminster party. But trying to do that on legislation that will save peopleâ€™s lives should not be the place to start. A guest from Kirsty Connell, former Labour candidate and Vice Chair of the STUC’s Young Workers’ Committee. Thanks Kirsty! Bigotry, booze, a better wage. The SNPâ€™s priorities as they return to Holyrood after recess are clear. Tackling sectarianism, introducing minimum pricing for alcohol and bringing in a Scottish Living Wage across the public sector. Noble causes. But behind each of the social ills these three priorities attempt to remedy, a wider malaise lingers. The same sickness that infiltrated the riots earlier this month, the same that has and will continue to haunt Scotland. Poverty. Discrimination. Violence. Poor health. All can be entwined, with one leading to the other. Equally they can be separate, afflicting an individual with one but not another. Each however has a common factor, snarling alongside each evil: the black dog of poor mental health. The link between joblessness and poor mental health is both obvious and stark, especially among young people. According to The Future You, an online mentoring service,Â one in four young unemployed Scots has considered suicide. Although Scottish unemployment fell between 7.7% in early 2011, theÂ rate of youth unemploymentÂ is stuck at 20%. In fellow devolved nation Wales, the Princeâ€™s Trust found 48% of unemployed respondents to the 2011 Macquarie Youth Index claimed their lack of work led toÂ panic attacks, self harm and self loathing. Itâ€™s not just a problem for devolved nations, nor does it just affect those out of work.Â According World Health Organisation data published recently inÂ Lancet, mental health disorders make up almostÂ half of the diseases affecting the worldâ€™s adolescentsÂ and young adults. It might not just be Scotlandâ€™s problem, but that doesnâ€™t mean itâ€™s a crisis the Scottish Government can ignore out of supposed powerlessness. The push for improvements in young peopleâ€™s mental health is still from outwith government. The British Association for Counselling and Psychotherapy continuesÂ to call for a trained counsellor in every school. Family Nurse Partnerships and the early detection of cancer are welcome and necessary health policies, announced by the SNP during the election campaign. But no party in Scotland has a national strategy to implement the 2005 reportÂ The Mental Health of Children and Young People, which called for provision of confidential and accessible counselling for all young Scots by 2015. Drinking because thereâ€™s nothing else to do. Invoking seventeenth century Irish politics as invective because sights are so narrowed. Struggling to even access a wage. If Salmond and the SNP truly want to transform Scotlandâ€™s wellbeing, beyond mere physical health to a truly fit society, more thinking with – and for – the head is required.